CSS supported NASA's Aeronautics Research Mission Directorate and the California Energy Commission to demonstrate the feasibility and scalability of the OMEGA project with respect to its biology, engineering and economics; and to help ensure that its environmental impact remains beneficial at the large scales needed for commercial application. 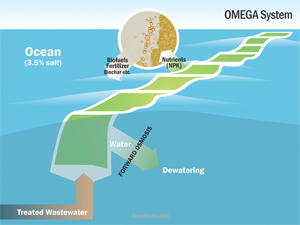 The OMEGA system consists of large plastic bags with inserts of forward-osmosis membranes for growing freshwater algae in an ocean environment. Using energy from the sun, the algae absorb carbon dioxide from the atmosphere and nutrients from wastewater supplied from coastal municipal treatment plants. Potential benefits include oil production from the harvested algae, and conversion of municipal wastewater into clean water before it is released into the ocean via forward osmosis. After the oil is extracted from the algae, the algal remains can be used to make fertilizer, animal feed, cosmetics, or other valuable products. CSS managed this project and its subcontractor, URS, which was responsible for the engineering services. CSS also designed, developed and tested a prototype CO2/pH control system for this project. This successful spinoff of NASA-derived technology is envisioned to help support the commercial development of a new combined algae-based biofuels and wastewater treatment industry.